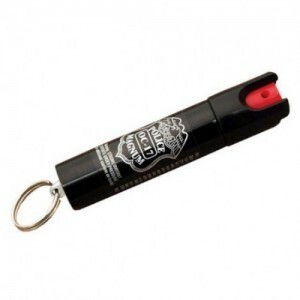 PEPPER SPRAY is probably the most common item in a girl’s arsenal. It’s what I always carry around. I got to use it once too. I can assure you: it works! It’s very effective from a distance, it can be used to subdue an attacker before he or she even get the chance to step into your personal space. Once you render your attacker unable to see, you can take your chance to flee from the confrontation or apply direct blows. 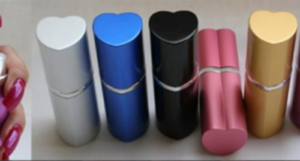 Many come in small tubes, having a key chain to which you can attach your keys. Others come in larger tubes. The braver girls out there should know that large cans of bear mace are available for purchase. Some are even disguised as common lipsticks, to make it easier to reach for without attracting too much attention. THE HONEYCOMB HAIRBRUSH made by Cold Steele is a very innocent looking blade disguised as a fully functional hairbrush. The brush head pulls off, revealing a pointy blade attached to the handle. It’s very durable and strong, as it’s made from Zytel (a stiff nylon fiberglass composite). The blade has no cutting edges. It’s meant for stabbing, not slashing. So keep in mind some arm strength is required to thrust this into flesh! An alternative to the honeycomb hairbrush is the COMB KNIFE. Its blade is similar to that of the brush, serving the same purpose. THE BRASS KNUCKLES is yet another easy to reach for item which can inflict pain upon everyone who tries to mess with you. It’s used for close combat. Slip your fingers in the holes and if your arm is strong enough you can easily knock out your attackers. As an alternative, the KUBOTAN (aka. 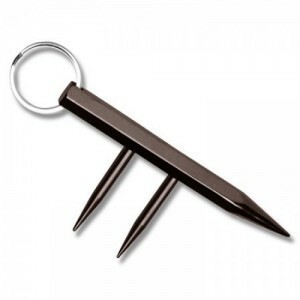 NINJA SPIKE) can be used in a similar way. The difference is that its spikes can pierce through skin, leaving open wounds. It can also do irrecoverable damage to the eyes, so use with care and only if you must! Both of the items also come as key chains. 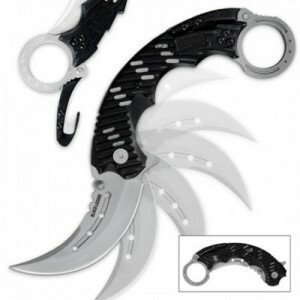 THE OPEN ASSIST KNIFE is a small switchblade-like weapon which can easily open with thumb. It’s not a regular switchblade, as these are illegal in most states. This tiny knife comes in many shapes and sizes. Some have regular strait blades, while others have curved blades, acting as a meat hook. Most states allow the carry of a blade no longer than 3’’. It can be used for slashing and stabbing alike and it can easily pierce through regular clothing. Best brands out there are Spyderco and Emerson. 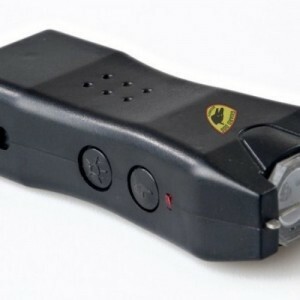 THE TASER or STUN GUN is one of the most popular choices in self defense gear. It’s small, easy to use and it renders everything with a nervous system useless in seconds. It fires an electroshock at the target via 2 electrodes of 50K V instant and 1.2K V sustained. Earlier models were only suitable for close quarter encounters, but newer models (available to police and military forces only) are capable to shoot the electrodes up to a distance of 30 feet. 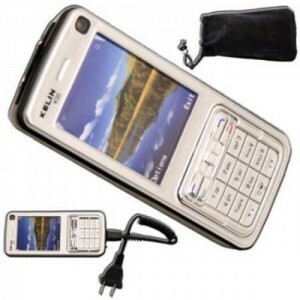 For those of you who value the element of surprise know that you have stun guns available, cleverly disguised as ordinary mobile phones. 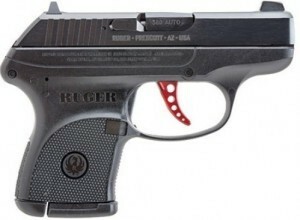 THE RUGER LIGHTWEIGHT COMPACT PISTOL (LCP) is the perfect choice for the most action loving girls out there. Is one of the smallest calibers available (.380 ammo), but it’s more then enough to even be fatal. It was released in 2008 as a back-up weapon for police forces and as a self-defense weapon for civilians. It’s small and light, weighing only 9.4 ounces. It comes with a leather holster, but it can easily be stored in a regular pocket. It’s a firearm which can be fatal if used irresponsibly, so be cautious! You might be tempted to think that these gadgets is what give you the upper hand in a direct confrontation, but you’d be wrong. KEEPING CALM, is what will always save your skin, even if you’re unarmed. If you find yourself being the target of an aggression and you’re unarmed, remember there are many things you can use for self defense. Your skull could be the first line of defense, as in most cases women are approached from behind. You can hit his nose with the back of your had or even with the forehead, if he stands in front of you. One of the advantages of being a woman is that most times you carry a purse around. Grab the first thing from your bag that you can turn into a weapon: a pen /pencil can be used for stabbing, keys for scratching and wounding and deodorant spray for attacking the eyes. High heels and stilettos can be used as a very efficient self defense weapon if you can manage to take your shoes of sand slip your hand inside of them. This way you can protect yourself from blade attacks and even attack yourself. Remember: just because you’re a woman, doesn’t mean you’re easy prey. Fight back with everything you have!